From Batsuits to Lawsuits, Hollywood Studios have a long history of hiding profits to claim that enormous hits were actually flops. How do they do this, and why? Without adjusting for inflation, the Harry Potter series of movies is the highest grossing film franchise of all time. In fact, Harry Potter and the Deathly Hallows – Part 2 (2011) is the highest grossing Warner Bros. movie ever made. So… what if I told you that the Harry Potter franchise was actually a financial flop? Well you’d probably call me a liar or, at least, point out how ridiculously wrong I am because, let’s face it, that claim is obviously ridiculous. Wait just a cotton pickin’ second here. “Distribution Fees”? But Warner Bros. distributed the film. Who the hell are they paying that to? That was one question that arose when an official Warner Bros. receipt for the film was leaked online showing how the costs were allocated. According to independent analysts, the whopping $212 million that Warner Bros. spent on “Distribution Fees” was actually paid back to itself (or, at least, one of the divisions of the same company) in order to help tip the scales and make the movie “lose” money… at least on paper. How is this possible? Another look at that ledger shows $130 million allocated for advertising and publicity. Wait, what? Did Warner Bros. spend almost the equivalent to the film’s entire budget in order to market this surefire hit? Well, perhaps… but it's more likely that Warner Bros. paid itself, its properties or other divisions of Time Warner for this marketing (or a large portion thereof). And once these easy things are taken into account, there is no surprise that we can find things like $57 million in “Interest” (albeit completely undefined interest) and $315 million in “Negative Cost and/ or Advance” lurking around that spreadsheet like hungry money pits. Thus the film that earned $940 million at the international box office was actually a financial loss for the company of a whopping $167 million. Sound confusing? Or maybe the smug among you will smile and say that it’s clear that I, the writer, don’t understand this kind of accounting. Guess what! You’re right. That’s because such Hollywood Creative Accounting is designed to be confusing as well as impossible to figure out. This isn’t something I, or you, are likely to “get”. So why would a movie studio (or any company, for that matter) do such a thing? Why "lose" money? The answer is astoundingly simple. Companies like this “lose” money to make more profits for themselves. When contracts are written to share net profits with actors, writers, producers, directors or even other production companies, studios take a big hit. Therefore, to reduce (or in the case of “lost” moneys, eliminate) the amounts that a studio has to pay out, accountants will frequently massage the numbers to make that shared profit smaller and smaller and smaller until (quite often) it’s gone. Let’s take a look at another major studio. 20th Century Fox had just made boffo box office with Star Wars (1977) when one of the best, scariest and most profitable films of all time was released by the same company. It was called Alien (1979), it cost between $9 and $11 million to make and by April of 1980 the film had already made over $100 million at the box office. So, at worst that’s an $89 million profit for Fox, right? One would think. However, the Foxy accountants revealed that by this time the film had actually lost over $2 million for the studio since its 25 May 1979 release. Wow, 11 months of release and no profit (in spite of huge box office numbers)? How much longer could Alien possibly perform? Well by August of 1980 after a number of industry accountants cried foul and demanded a recount, Fox changed its story and indicated that by that time the film had made $4 million in profit for the studio. Yeah. Nobody believed that, either. Brandywine, the production company responsible for Alien thus sued Fox over the distribution of those profits, delaying the sequel that Brandywine was determined to make as quickly as possible. Fox, for its part, pointed back to its financial reports that indicated that Alien was, at best, a low earner and at worst, a money loser and thus, did not warrant a sequel. That lawsuit wasn’t settled until 1983 with Fox finally agreeing to fund an “Alien II” so that Brandywine could recoup some of the profits it knew belonged to it. In this case the bet worked out splendidly and that sequel, finally entitled Aliens (1986) made over $183 million against an $18 million budget and was also a huge critical success (matching the original) with awards nominations to back up that praise. While not all of that settlement has been disclosed to the media, the suit itself does give us a bit of a look into why this creative accounting takes place. Unlike as we have with Order of the Phoenix, we don't have any ledger explaining just how Fox (allegedly) buried the profits from Alien but the question of “Why?” is easily answered by looking at the partnership itself. In the case of Alien, Brandywine acted as the production company with input from Fox, which acted as something of a co-studio. The producers were all Brandywine personnel like Gordon Carroll, David Giler and Walter Hill, but the production funds themselves came from Fox, which actually doubled the budget when it saw director Ridley Scott’s impressive story boards. The producers, writers, director, cast and crew all were paid from this budget, but the companies involved relied on the profits of the film. In any partnership of this kind, profits are divided in the contractual phase of pre-production with the funding party naturally taking the larger slice of the pie and the larger company (usually the same) handling distribution and accounting. For the sake of this argument, let’s pretend Brandywine agreed to 30 percent of the net profits (the total revenue minus total expenses) of Alien, while Fox agreed to accept the remaining 70 percent. Keep in mind that the aforementioned expenses include revenue sharing with the actual exhibitors (movie theaters that own the actual box offices) as well as shipping costs (FedEx, Buena Vista Distribution, Film Tracking are just a few possibilities) and the cost of printing the actual films to put in those shipping cans, it’s true that the costs can add up. That’s where large box office revenues tend to cancel out the expenses. True, the more screens a film lights up, the more money it costs to make the prints to display on those screens, but in general the increasing number of tickets sold greatly exceeds that cost. In today’s market the cost to make a (non-digital) movie print is around $1,500. Alien opened on 91 screens and pulled in $3.5 million on its opening weekend. Assuming the cost of prints was comparable at $1,500 each (including shipping costs), that’s around $136,500 in print costs, but each screen pulled in $38,767 in the opening weekend alone. That means that in one weekend, each print paid for itself over 25 times over and then continued exhibition for a year or more. Sure, printing and shipping movies does not constitute the only release cost of a film, but this example shows how quickly a film can pay for itself. Thus we are still looking at huge profits around 30 percent of which Brandywine was entitled to. But what if 20th Century Fox employed a little creative accounting to keep that 30 percent from being too high? As we learned from the Warner Bros. example, Fox could both “spend” and “save” these dollars by utilizing companies under the same umbrella and ultimately while it is true that on paper the expenses were paid for and chipped away from the net profits of the film, much of the money never actually left the Fox family of companies. That is, of course, difficult to prove which is why such a lawsuit took so long to be settled (and still resulted in profits for Fox, thanks to the large successes of Aliens). Whether the books were ever opened or not (and they were not), it's true that Brandywine ultimately won the suit (albeit with little substantial hit to Fox) and went on to make six more Alien films in partnership with the bigger company. This suit was finalized in the early '80s before News Corporation purchased 20th Century Fox, before there was a Fox Network, a Fox News Channel or a Fox Sports Net. Warner Bros.' story is quite different. By the time of Order of the Phoenix’s 2007 release, Warner Bros. parent company owned half of the CW Network and all of HBO, Cartoon Network, CNN, TNT, TBS, HLN, Turner Classic Movies, Time Warner Cable, Warner Bros. Distributing Inc., Warner Home Video, DC Comics, Warner Interactive, Warner Bros. Music (and its subsidiaries), New Line Cinema and much more. 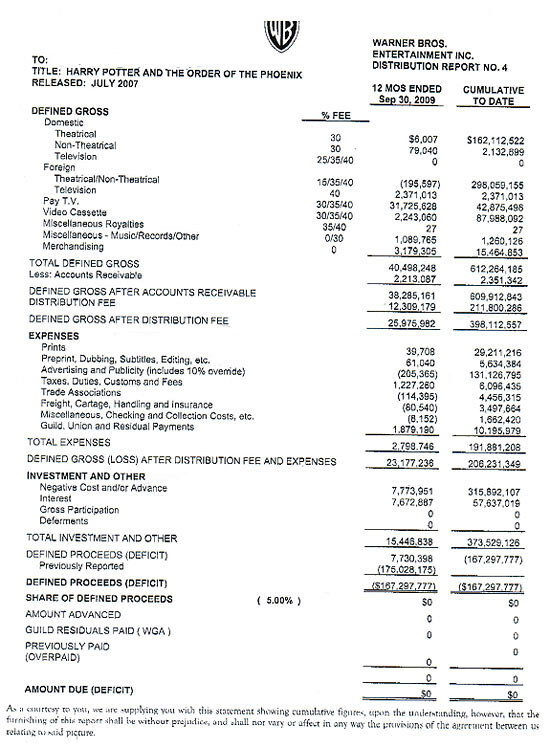 While we can’t know exactly how the expenditures broke down (the ledger is both mathematically sound and extremely vague) it’s easy to imagine Warner mandating that Phoenix trailers be placed at the beginning of any New Line or Warner Bros. features for months prior to that film’s release. Yes, this happens. As a former projectionist I had distributor preview mandates for most every print. Any Warner Home Video releases of Warner or New Line films could (and did) also have Phoenix previews included on the discs. Further, “brother-in-law deals” can easily be made with company advertising outlets including billboards, commercials on the varied Time Warner owned networks as well as empty spots on Time Warner Cable’s feed, full page ads in DC Comics and yes, HBO specials to help promote the film. Then there was also the obligatory soundtrack (thanks to Warner Bros. Records and Warner Sunset Records) and the video game (distributed by Warner Bros. Interactive Entertainment). All of this could easily be shoved into that undefined mass of “Advertising and Publicity” and “Negative Cost and/ or Advance”. How did the film actually get to the theaters? Warner Bros. Distributing Inc. Who published the DVDs? Warner Home Video. Again, why go to these lengths? The answer is similar to the Alien deal. There are a lot of chefs surrounding the Harry Potter cauldron, all of whom have a stake in the film’s success. There were no less than four Production companies involved with the creation of Harry Potter and the Order of the Phoenix, only one of which is Warner Bros. Cool Music, Heyday Films and a one-off company called “Harry Potter Publishing Rights” were all involved and are likely recipients of profit percentages. It's not unheard of for actors contracted to long running series to be compensated, in part, by small percentages of the profits and this saga lasted over a decade of these primarily youthful (and arguably irreplaceable) actors’ lives. That is not to mention author and creator J.K. Rowling herself, whose percentage comes from somewhere. Thus, Warner Bros. stood to lose a lot of profit by making (or at least, reporting) a lot of money. The smaller the net percentage, the smaller the amount Warners had to share. In spite of the $790 million in profits, Warner Bros. claimed that amount was actually minus $167 million. Any percentage of a negative number is a negative number (even if Time Warner’s own cut was not so negative). This clearly illustrates how a company (particularly a conglomerate) can both spend more money than it takes in on a project and still make a profit (albeit clandestinely). Warner Bros. and Fox are definitely not the only companies in Hollywood to employ this sort of creative accounting (nor is this merely a Hollywood phenomenon, if the word “Enron” means anything to you). So creative accounting may be a common practice, but is it legal? After all we didn’t hear many entertainment companies swept up in the accounting investigations of the early '00s. There is a grey area there, and the legality of this sort of profit sharing tends to be defined only when lawyers can prove damages. This usually requires the close inspection of a studio’s books and accounting methods and you can imagine how they might resist such scrutiny, especially when their own profits might be erased in fact as well as on paper. Let’s take a look at Paramount Pictures for a moment. While Rowling’s percentage deal with Warner Bros. is not known at the time of this writing, the doctoring of books has excluded authors from their contracted percentages to keep more money for the company. For example, Winston Groom was granted three percent of the profits of the enormously successful adaptation of his book Forrest Gump (which hit theatres in 1994), but in spite of making $678 million against a $55 million budget, distributor Paramount claims that distribution and exhibition fees caused the film to actually lose $62 million. Again… the distributor… blamed distribution fees. Curious, isn’t it?